From The Guardian: Agents from US Immigration and Customs Enforcement (Ice) arrested more than 150 people at a trailer manufacturer in north Texas following allegations of immigration violations. At a Tuesday news conference shortly after the raid, officials called the arrests “one of the larger work site enforcement operations conducted at one site in the past 10 years”. It comes amid a sharp increase in such raids under the Trump administration over the past year. The raid was carried out by Homeland Security Investigations (HSI), a branch of Ice. 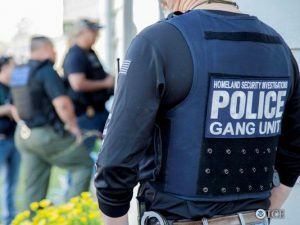 Katrina Berger, the special agent in charge of HSI’s Dallas office, called the suspects “illegal aliens who are unlawfully working here in the United States at this business”. Berger said that the raid came after receiving tips that the company, Load Trail, hired undocumented immigrants who had used fraudulent identification documents. One witness told the Dallas Morning News that armed agents came in from “every corner”. “They drew their guns and told everyone to hit the ground,” Dennis Perry, a Load Trail factory worker, told the paper. Some people went running and were tackled, Perry said, adding that a few workers hid by shelves but were quickly discovered. Worksite immigration raids have become increasingly common under the Trump administration. In June, immigration agents targeted a meatpacking plant in Ohio, and arrested more than 100 workers suspected of using stolen or fraudulent identification. A raid at a meatpacking plant in eastern Tennessee in April ensnared a similar number. The arrests in such raids have almost entirely been “administrative”, not criminal, meaning that arrest warrants only need to be signed by immigration agents and not by a judge. Ice “administrative” arrests of immigrants without criminal convictions have spiked 203% in the first full 14 months of Trump’s presidency compared to the final 14 months of the Obama administration, growing from 19,128 to 58,010, according to an NBC report. Load Trail, which did not immediately reply to a request for comment, could also be punished. As a part of the administration’s hardline stance on immigration violations, officials have indicated an increased focus on penalizing employers who knowingly hire undocumented people. This entry was posted in crime, DHS, Donald Trump, Good News Stories, illegal immigration, Taxes, United States, US Presidents and tagged Homeland Security Investigations, HSI, ICE, Load Trail, Texas. Bookmark the permalink.